In May 2018, Sauvin is invited to the newly opened exhibition space FG2 in Gothenburg to show a selection of works based on the Silvermine archive. Including the meticulously carried out album “Xian / 线” among other projects such as “Until Death Do Us Part / 双喜” and “Silvermine Albums”, the exhibition forms the most extensive presentation of Sauvin’s work so far in Sweden. For this occasion, the artist has invited the founders of FG2, Klara Källström and Thobias Fäldt, to interact with the archive. The exhibition has found its form through a collaborative process between the three artists and Nadén Arkitektur who has produced the exhibition at Nadén Snickeri. 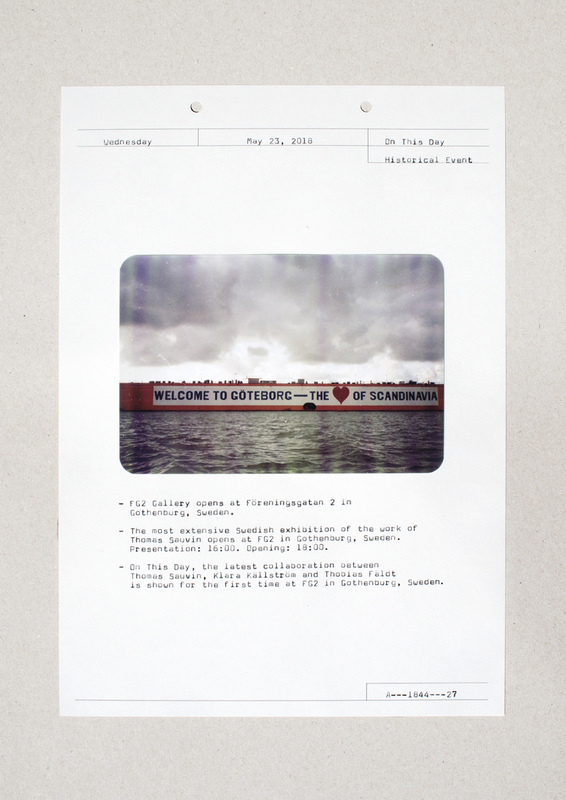 Comprised by a selection of texts entitled “No History, No Problem” by writer Johannes Wahlström and photographs from the Beijing Silvermine, the new project “On This Day” is the result of a collaborative work starting from the idea of the ‘Silvermine archive meets Onthisday.com – ”the world’s largest historical events online database” ‘.